From the first settlement called Cadwell's Corner to Leclair to present-day Deerfield, the identity of Deerfield, Illinois, has changed over the years. Providing a reputable and safe community to its residents has been an important focus of the village of Deerfield, despite some of its controversial means to do so. But safety and reputation cannot solely provide a community's identity. Today the village hosts some well-known corporations such as Walgreens and Caterpillar, Inc. and is home to nearly 18,500 people. Truly, the many residents, both corporate and individual, give Deerfield its current identity, displaying their tastes and styles in both architecture and design. One way that the citizens have done this is by maintaining greater home values than some other Chicago suburbs of similar size. With successfully maintaining those home values comes the maintenance and upkeep of the homes themselves. Garage doors will always need periodic maintenance and repair and eventual replacement and updating. 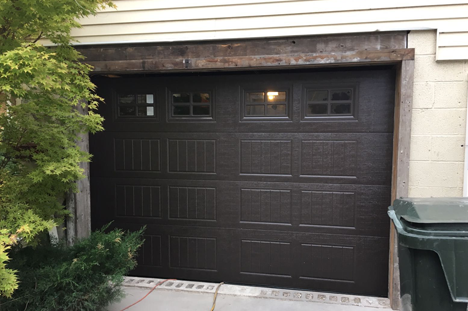 The experts at BSD Garage Doors can inspect and perform preventative maintenance on your door, as well as repair it when it is not working well. BSD Garage Doors offers the Deerfield community services such as: broken spring repair, noisy garage door repair, broken garage door sensor repair, garage door tune-up, garage door repair and replacement, electric garage door opener repair, and outdoor keypad or remote-control entry solutions. BSD Garage Doors offers the convenience of 24/7 emergency service, and the assurance of a family-owned business with 10 years experience. With competitive pricing and discounts for senior citizens and current AAA members, BSD Garage Doors is licensed, bonded, and insured to service any garage door system issue in Deerfield and the surrounding areas. Call today to schedule your free estimate!